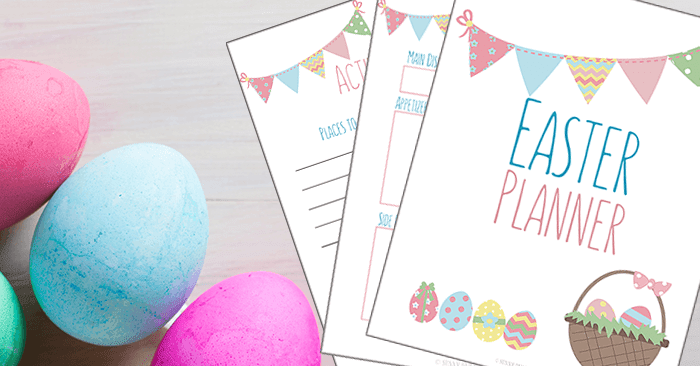 This printable Easter planner will get you organized for a low stress family holiday. We had barely opened our Valentines when my boys announced that it was time to take down the snowman decorations from the mantle and get out the Easter bunnies. Easter is a big deal in our family and one of my favorite holidays too. But like most family holidays, I need to get organized to make sure that everything gets done and we all have fun without increasing my stress level. 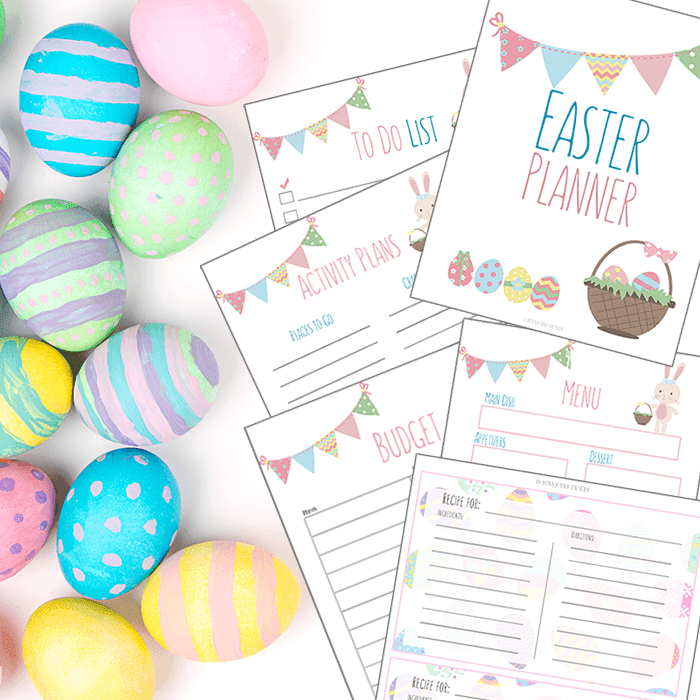 That's why I've put together this printable Easter planner - the perfect addition to your daily organizer to keep all of the details of your family's Easter celebration under control so that you can enjoy your holiday (and maybe some chocolate too). Easter brings so many opportunities for family fun and celebration. There are crafts and activities to try and eggs to color and hide. As a kid, I loved picking out my new Easter dress and an Easter bonnet to wear to church and to hunt for Easter eggs afterwards. Whether your big meal is Easter Brunch, Easter Dinner, or both, Easter gives us a wonderful chance to gather with family to celebrate. And have I mentioned the chocolate? With all of this excitement there are a lot of details to keep organized, especially when you have little kids who want to experience everything the holiday has to offer. That's why this Easter planner is such a lifesaver - you can keep everything in one place, stay organized, and actually enjoy the holiday with your family. Undated Month at a Glance - Keep important dates in one place and start with any date you'd like. To Do List - One place to keep all of your important tasks at hand, with easy checkboxes for when you're done. Budget Tracker - Keep your grocery, gift, and decor budgets in check with this handy planning page. Activity & Craft Planner - Decide which fun Easter crafts and activities you will do - brainstorm and keep track here. Project Planner - A more detailed planning page for decor projects or crafts. Works great for coordinating your Easter egg hunt too! Gathering/Event Planner - Hosting an Easter get together? Plan it here, and keep track of guests with an Invitation/RSVP Tracker. Easter Menu Planner, Grocery List, and Recipe Cards - Everything you need to plan your Easter meals! Easter Invitation & Thank You Cards - Invitations and Thank You Cards that you can customize and send. 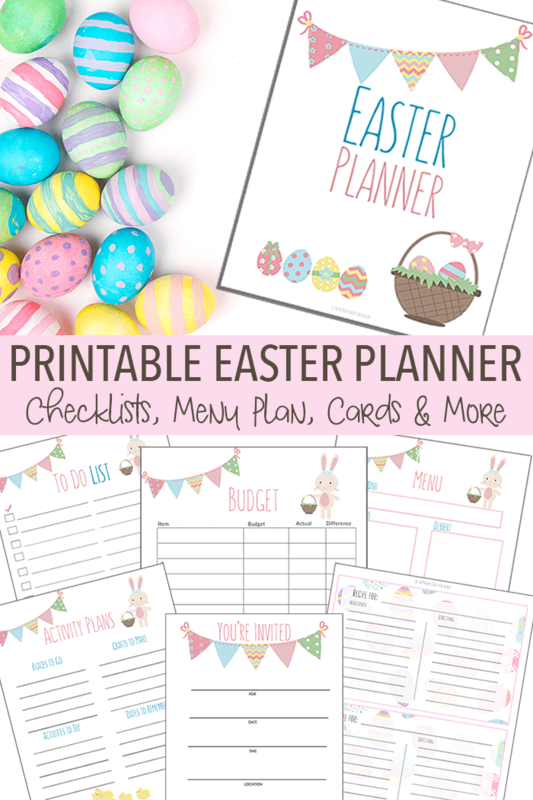 You can print the Easter planner in 8.5x11 or A5 (half size) to fit your existing planner. It works great as a section in your Happy Planner!